I recently started using wireless broadband for my mobile internet access. While I was able to get around 1mbps at my office location, the coverage doesn't extend well to my housing area. I have to be contented with EDGE. EDGE would still be okay for my occasional internet need at home but the signal strength is so bad that I could barely make any connection. So, again, I'm off to the internet for a solution. A full parabolic dish would probably be an overkill for my need so I settled with parabolic reflector instead. After about 20 minutes on the PC for the parabolic design and g-code generation; and another 20 minutes on the Sherline CNC, my simple parabolic reflector was born. Made from acrylic (left over from other projects, thus the multiple colors), the reflective portion is covered with the kitchen grade aluminum foil. As shown above, the reflector can be set vertically on the table or attached to a normal handphone holder bracket for more articulated positioning (below). As always, me as skeptical as ever... wondering whether Google will actually make the payment since I've heard various horror stories regarding the AdSense payment. Well, my balance finally hit the magic USD100.00 minimum required for payment and I anxiously waited for the moment. After typical processing time line, I check my account at AdSense again and it was stated that payment has been issued (without any email advising me on the matter). 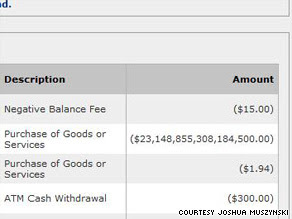 To avoid possible embarrassment at the bank, I called up Western Union customer care to check if the payment is valid and genuine. The Philippine lady who answered my call confirms it. Just took delivery of my new ER16 MT1 chuck and collets yesterday from CTC Tools (eBay Seller). Fixed it to my Sherline and seems to be okay. Just needed to get an M6 x 100 screw to anchor the chuck to the Sherline spindle then I'll be set... No more hammering to get the chuck out... Just twist the collect holder and my bits are free... After fixing the ER16 chuck, I'll loose around 1.5" of vertical travel but that's not much of a concern for me... Photos show the new ER16 chuck next to the various earlier (Sherline) milling collets, drilling chuck and endmill holders. To my friends, my sincere apologies for any wrongdoings in the past, present and future. Have a safe and wonderful Hariraya. Upon further reading, I learn that the HCl + H2O2 solution have short shelf life. So I decided to test my solution. 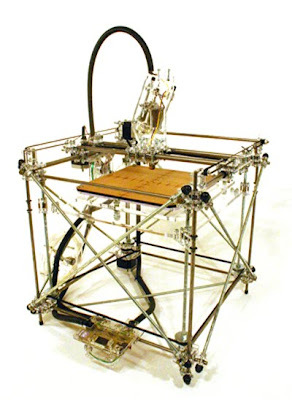 True enough, it wasn't able to etch any PCB. I'm not sure what's the cause yet but my guess is that I need to add the 'starter' copper immediately after mixing the HCl + H2O2 to stabilise the solution so that the solution is CuCl2+ H2O instead of HCl + H2O2. This site has very complete and full of technical information on the subject. 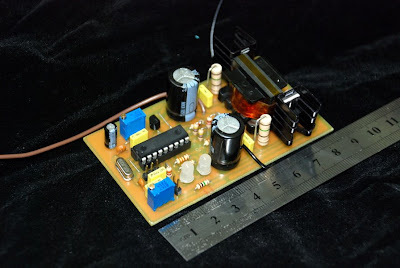 After more than 20 years relying on Ferric Chloride as my etchant for PCB, I decided to switch to a new solution for PCB etching that promises faster etching, cleaner solution and recycle-able chemicals. After review of several sites on the internet, I decided to go with the Hydrogen Peroxide/Hydrochloric Acid solution. Photo below shows the starting chemicals, i.e., muratic acid (31.45% HCl v/v) and Hydrogen Peroxide (6% H2O2 v/v). 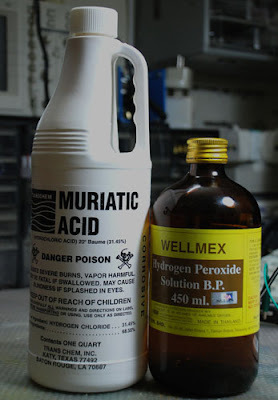 The muratic acid (1 quart, ~950ml) was obtained from Ace Hardware, normally used as cleaning agent. The hydrogen peroxide (450ml) was obtained from a pharmacy. For the volume of solution that I required and based on the concentration of chemical available, my etchant is made by adding 600ml of the muratic acid to 900ml of hydrogen peroxide yielding 1.5 liters of etchant. 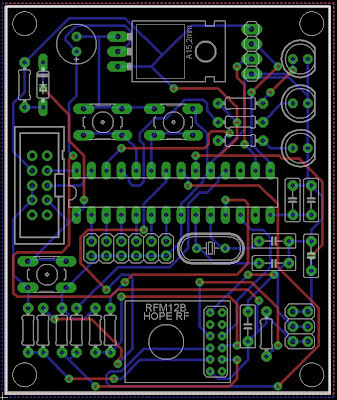 After review of the first RFM12B-USB interfacing, I noted that I'm driving the RFM12B over the design spec wrt the power supply. 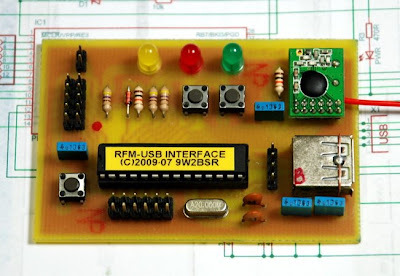 RFM12B is designed for 3.6V max VCC whereas USB supply typically is near 5V. As such, I've redesigned the interface to be 5V friendly with on-board 3.3V regulator and voltage dividers on the signal lines. BOSS wants sales update every 1 day. STAFF should MAXIMISE time outside of office. Staff updates can be done inside the office only. No way to contact STAFF once they are outside of office. The BOSS and staff do not use watches. They only have timer/stopwatch (95% accuracy) thus statement "Update me at 3.30pm" cannot be used, but "Update me 30 minutes from now" is acceptable and the timing may be off by 5%. Only 1 party (BOSS or STAFF) talk at any given time. The updating only takes 2 minutes! BOSS and STAFF works 24-hours per day. Find the most effective way (scheduling or otherwise) to get sales update on time and maximise STAFF time doing sales. Further to my earlier blog that I was having problem to program PIC16F88 when MCLR is disabled and using internal clock as system clock, I just come across the following note added to the (new?) UIC00A User Manual from Cytron. Please take note of the limitations. BTW, the PIC is not spoiled. After the 5s nap, RFM will wake up (5% accuracy) and will pull the nIRQ line low. The nIRQ line is connected to one of PIC 'interrupt-on-change' pin. The change in voltage level wakes up the PIC and it will continue to execute exactly where it falls asleep. As mentioned by 9W2DTR, the RF transceiver modules we ordered have arrived. It's a 433MHz module capable of max speed of around 115 kbps, tx power of 7dBm and SPI interface. Since I'll be doing my development on a prototyping board, I needed a way to mount the module. The module's headers are 0.5mm, 2.0mm pitch whereas a standard prototyping boards are 0.1" pitch. A quick clicking on Eagle, and a few minutes later, the adaptor was born. 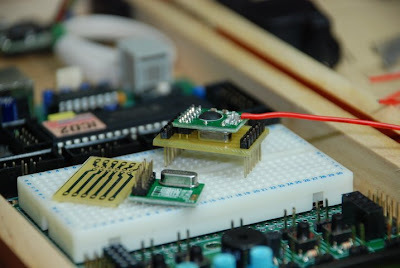 Photo above shows the RF module mounted onto the prototyping adapter and it is sitting on top of the Futurlec PIC18F4550 development board. 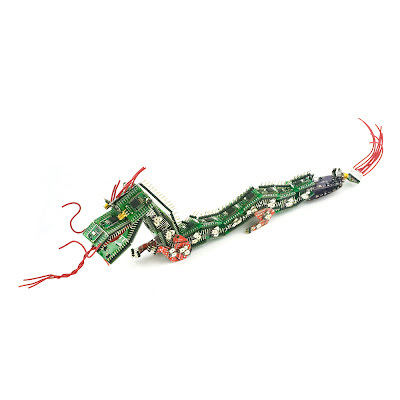 The 0.1" headers are reverse mounted on the PCB, i.e., the header protrude on the solder side instead of the component side. 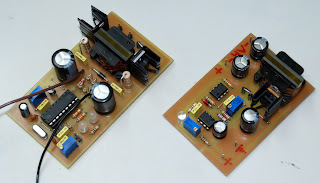 The loose module and adapter PCB are infront of the mounted module. 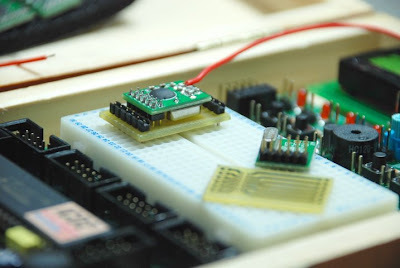 Photo below shows how the module looks once mounted to the prototyping board. There are still two (2) holes on either side of the headers to allow for jumper wires. 2009.06.18 Update: The adapter worked as expected. The only issue is that the current limit resistors need to be 'adjusted' based on the LM317 used. 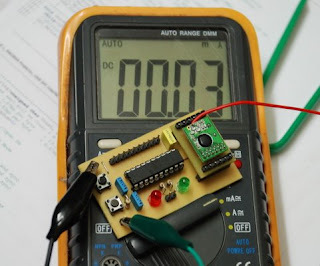 LM317 reference voltage is guaranteed to be between 1.2V to 1.3V. If the resistors are calculated based on 1.25V, maximum possible error is around 4%. 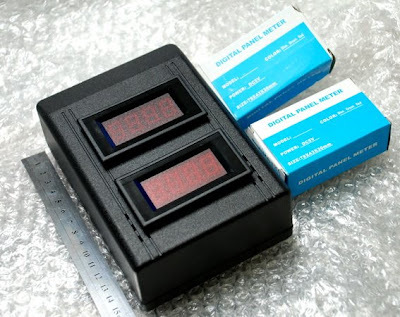 It's best to tune the resistor using a digital ammeter. Also note that circuit also measure probes resistance. As such, you need to deduct the voltage drop when the probes are shorted in order to get the actual resistance... If you set the current to 10mA then resistance is 1 milliOhm per 1 milliVolt. 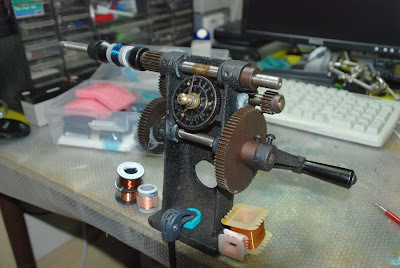 Made from an old RC servo motor, the baby winder has smaller shaft (M6) thus I could wind smaller cores. It's a simple setup. 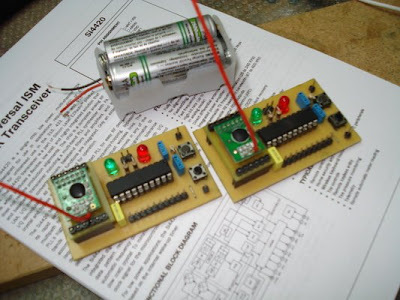 The servo electronics was gutted and the power is connected direct to a power supply. The on-off switch is there to control the baby during winding. 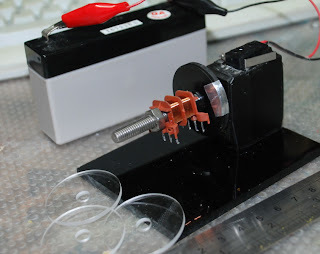 The bolt was sandwiched between two plastic plates (courtesy of my cnc) and fixed with epoxy. The shiny aluminum foil is for me to count the number of revolution. 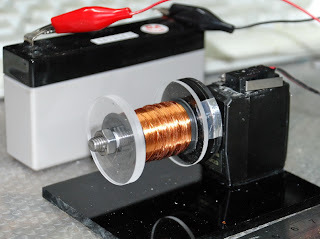 The setup is running at 60rpm with a 6V supply. I've got a few friends asking me to guide them on how to use the Cadsoft Eagle for schematic capture and PCB production. 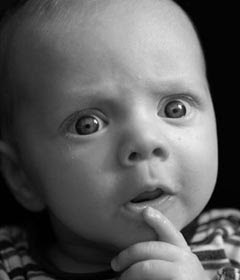 So, in the spirit of sharing, I'm planning to organize a training/familiarization session on the software. The session will be held in a friend's office, during a weekend. The room will be air-conditioned with LCD projector available. However, participants need to bring own computer to participate on the hands on exercises. 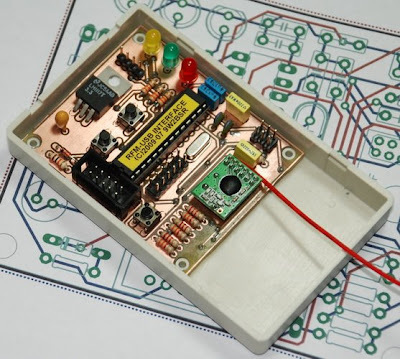 The basic areas to be covered are: Schematic capture, converting it to PCB, doing some electrical rule check and design rule check, and if time allows, we'll touch on creating own library. 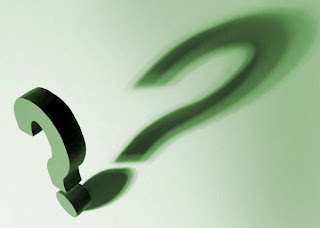 If you are keen, please drop me a line either by the chat box or comments on this blog. Meanwhile, the software is at Cadsoft and here is the product tour. After several countless nights without REM sleep and tons of downloads from the net, I finally managed to get my SMPS to work as intended. Final board shown below. Few learning points for me on SMPS. The rectifier diode recovery time is a critical parameter. Consider the switching frequency in diode selection. 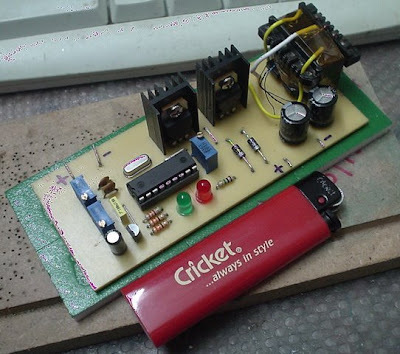 Slow diode will result in short circuit like behaviour on the secondary. Use of snubber circuit on the mosfet help to reduce the voltage spikes. Filtering and emi protection for sensitive digital circuit. 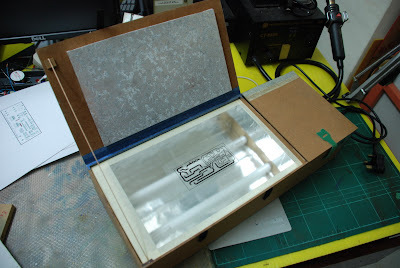 Since some of you are wondering how my UV exposure box looks like, I shot the photos below for your viewing pleasure. 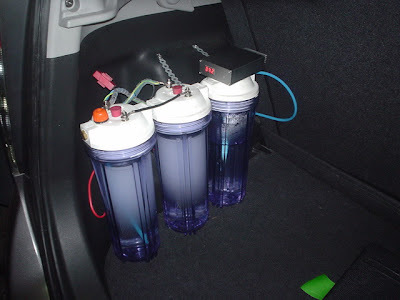 The unit uses 2x8W UV lights obtained from Farnell. 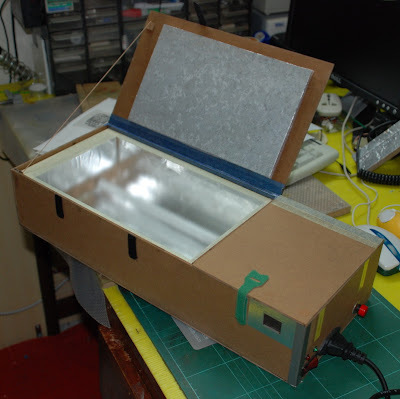 The box was fabricated from HDF board (the same board used by picture frame shop) and the exposure area was lined with aluminum foil to improve reflectivity. The tubes are about 4" apart and 4" below the frosted glass. The frosted glass is intended to diffuse the UV so that there are no UV bright spots. 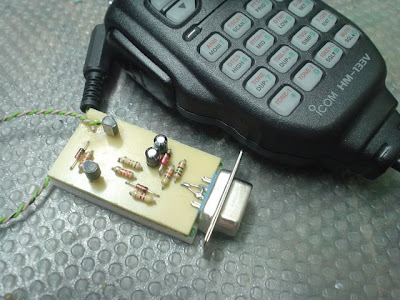 Hello again to all amateur radio in Malaysia. Rule 17A. Prohibition on the use of hand held telephone. (1) No driver, whist driving a motor vehicle on a road, shall use, or attempt to use, a hand-held telephone or any other communication equipment unless it is used through a hand-free kit. 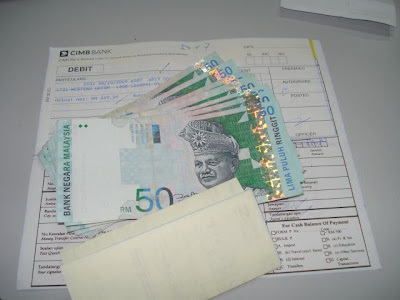 (2) Any person who contravenes subrule(1) shall be guilty of an offence and shall, on conviction, be liable to a fine not exceeding one thousand ringgit or to imprisonment for a term not exceeding three months and, in the case of a second or subsequent conviction, to a fine not exceeding two thousand ringgit or to imprisonment for a term not exceeding six months or to both. For the benefit on some of my Sorento buddies, here is my Sorento fuel consumption chart for reference. Click image for fullsize chart. Here are some photo of the most recent installation done by my colleagues. 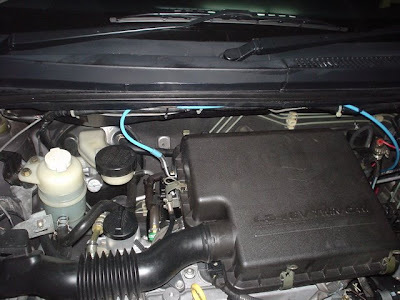 The vehicle is Perodua MyVi. The vehicle is 3-years old and already clocked around 150,000km. 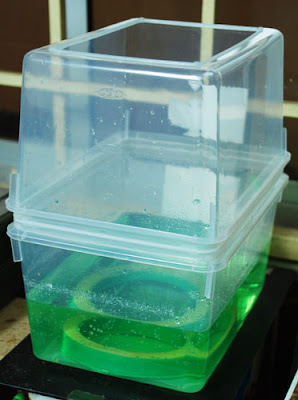 Pictured below is the homebrew electrolysis unit consisting of two cell and a bubbler. 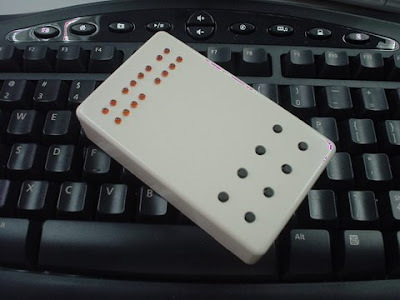 Noticed the small box on it.... Yeah, it's my digital PWM controller blogged earlier. All system go, working as planned. The tubing brought from the rear of the car to the air intake filter. I just want to thank all those who peruse this blog. Yesterday, this blog hit the 20,000 visits mark. I think it call for a celebration. I never expected that many hits for a much like a personal technical diary. My analog current controller (not blogged) has been working okay thus far. As always, some of us are never satisfied unless they see some LEDs blinking somewhere to reconfirm that the unit is working. 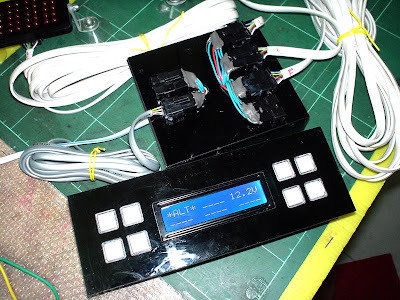 So I embarked on making a current controller that's digitally based so that I could display some functions as well as eliminating the need to open the casing to set the current, etc. This new controller do that. 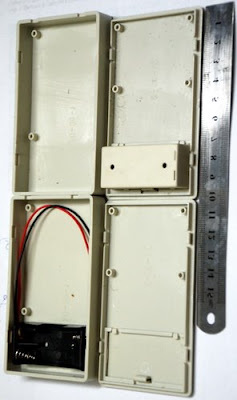 It displays the line voltage, the current draw, the PWM frequency, the current limit and the cut off voltage. Setting the current and cut off voltage is done by a single switch brought to the front of the unit. 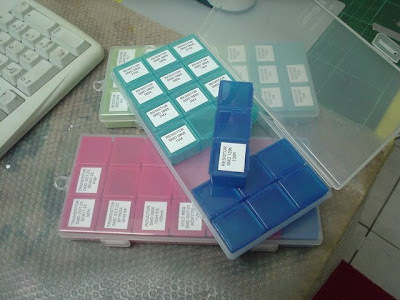 There are several type of the weekly pill organizers. Get the one like mine below for the following reasons. It's cheap, translucent and not pre-printed. Simpler for you to print and stick your own. I've had the Icom IC-2200 2m transceiver for the past few month for my base unit. I haven't been using it for a long while as I seldom QSO when I'm home... too many other things to do... Lately several new repeaters have been on the scene and as always... read as being lazy... I take not effort to update the IC-2200 frequencies.